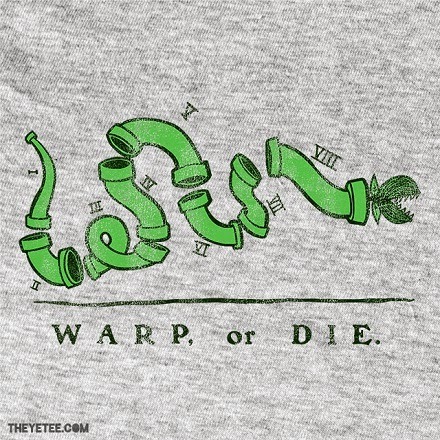 If Ben Franklin were alive today, I'd like to believe he'd be all over today's offering (10.01.13) from The Yetee, "Warp Or Die" by Mike M. This mashup of Ben's historic woodcut and the infamous Piranha Plant is ingenious. The design is even still sort of promoting freedom, as The Yetee is allowing you to choose between a heather gray or pipe green blank. UPDATE - 11.24.13: This is now available in the YeteeMart for $17.